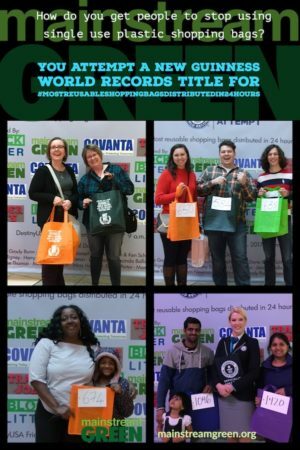 Let’s Win the GUINNESS WORLD RECORDS™ title / reusable Shopping Bags! 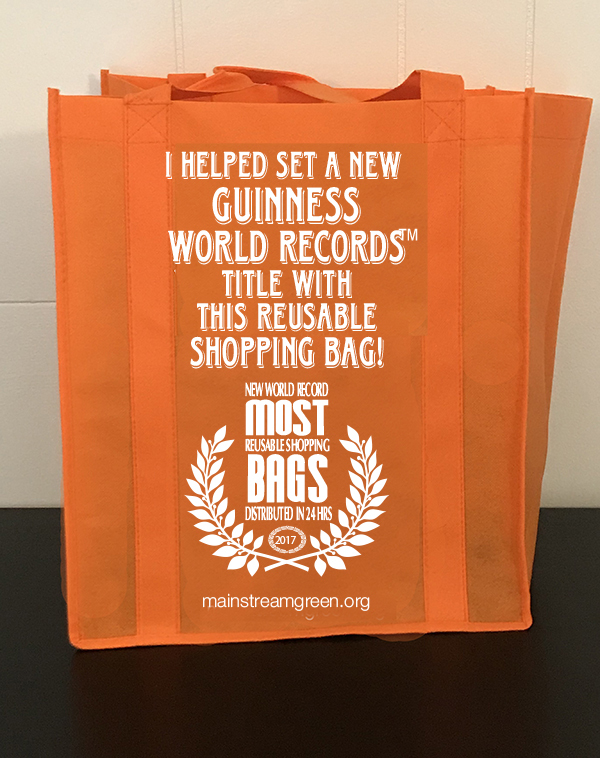 – Mainstream Green, Inc.
Home Let’s Win the GUINNESS WORLD RECORDS™ title / reusable Shopping Bags! 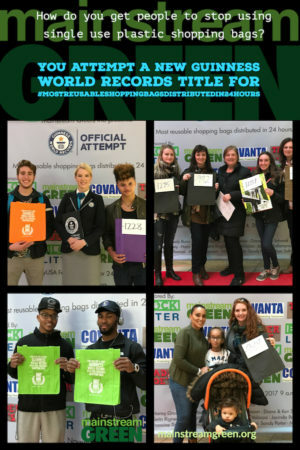 On Friday, November 24, 2017, Mainstream Green, Inc. attempted something that had never been done before: a new GUINNESS WORLD RECORDS™ title, Most reusable shopping bags distributed in 24 hours. The event was held at DestinyUSA, in Syracuse, NY on one of the busiest shopping days of the year, Black Friday. Although our location presented an unanticipated challenge, we accomplished a lot and had a ton of fun. Check it out here! We are planning another attempt at the record title during the second half of 2018. UPDATE: Second attempt at GUINNESS WORLD RECORDS™ title to take place in 2018. HELP MAKE ENVIRONMENTAL HISTORY WITH US! We need 80 volunteers to team up to win our 2018 title attempt for #MostReusableShoppingBagsDistributedIn8Hours: Click to sign up to volunteer! We can turn "Black Friday" into "Green Friday" this year, & make environmental history! Mainstream Green Inc. is teaming up with the Onondaga County Block Litter program, Covanta Onondaga LP, Trader Joes, DestinyUSA and others to make global environmental history in Syracuse, NY on Friday, Nov. 24. 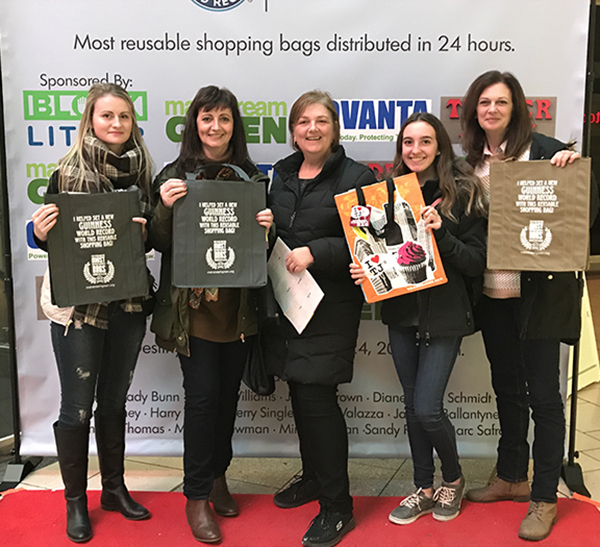 It will be the first time ever on Planet Earth that this brand new GUINNESS WORLD RECORDS™ title will be attempted: Most reusable shopping bags distributed in 24 hours! Our target is 5100 bags! STOP BY TO PICK UP YOUR BIG, STRONG, BEAUTIFUL & FREE BAG! DestinyUSA, Syracuse, NY, lower level behind Santa, Friday, Nov. 24, 2017 @ 9 am until… whenever we run out of bags! Pick up a colorful, roomy, sturdy,well designed reusable shopping bag that you take with you any time you shop! This is how disposable plastic shopping bags end up polluting our fresh water and oceans, seafood and bodies. 720,000 plastic shopping bags are consumed in the US every minute.They are made using petroleum, which is extracted, processed and transported, releasing harmful greenhouse gases into the earth's atmosphere. Lots of plastic bags wind up in the bellies of wildlife, killing them. What's worse is, plastic has so invaded our food chain and water supply that 93% of Americans have BPA, a plastic chemical, in their bloodstreams. It is estimated that by 2050, there will be more plastics than fish in the world’s oceans.